How much heat can be blocked with titanium brake backing plates? - Do titanium brake shims really work? Prove it! * How much heat do these brake heat shields block? - Choosing the best material for brake backing plates. - How do I install brake heat shields? - Got any hard numbers on temperature reduction? - Brake heat shields vs brake cooling ducts: which is better? - Titanium brake shims vs big brake kit upgrade. - What benefit do these provide once the calipers are heat soaked? - Why kind of titanium do you use? - How do brake heat shields reduce brake maintenance? - What race teams use titanium for racing brakes? - Where does the shielded brake heat go? - How do brake heat shields increase pad life? - What about upgrading to track brake pads? - Will these fit with new pads? - What should I do with my existing (OEM) shims? - What do aerospace engineer genius types think about these? - Will these shims cause or prevent brake squeal? - Can these stop my calipers from changing color? No more boiled fluid at CMP. Home >> Brake Heat Shields >> How much heat do these brake heat shields block? How much heat do these brake heat shields block? One picture is worth a thousand words in this case. 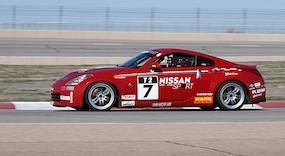 Take a look at this shim from one of our test racers after a hard session at the track. 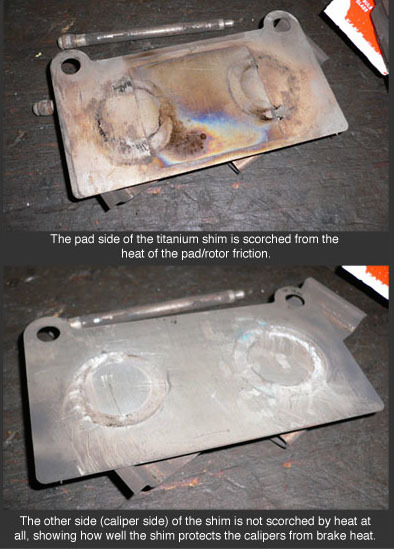 The pictures show that our titanium brake backing plate can prevent scorching heat from passing through the shim in track conditions. Want more information? Check out our controlled laboratory test results that show a reduction in temperatures at the caliper piston/pad interface of over 140F degrees! Also check out our track testimonials to learn about real world results from our customers and test drivers from the race track. Some of our customers report that our brake heat shields have completely eliminated their brake fade problems caused by overheating brake fluid, while others have found them to be an effective cooling element used in combination with brake ducts and other techniques. While our heat shields do not provide 100% protection in all extreme cases, they can make a critical difference in many situations. That advantage can be the difference between keeping your car on the track or visiting the run-off area.